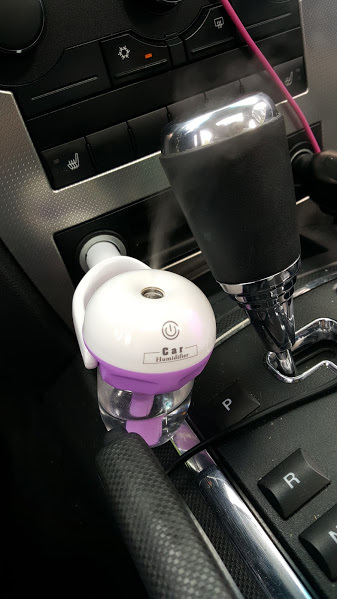 My Essential Ventures: Car Humidifier and Aromatherapy Diffuser? Yes please!!!!! Car Humidifier and Aromatherapy Diffuser? Yes please!!!!! How many of you have dreamed about using essential oils in your car to relieve stress while driving in traffic, or to cover up the I live in my car smell! I know I have! I work part-time and when I'm not working I'm carting kids from soccer to horse riding lessons to Tae Kwon Do. All produce smelly equipment that gets left in my car. 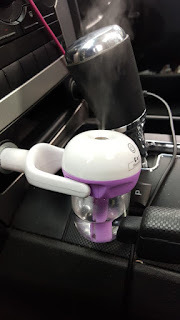 So when I saw Nanum Car Air Humidifier and Aromatherapy Essential Oil Diffuser I rejoiced. My husband, not so much. The first 3 comments I got from him was "O Brother," "don't burn your car down," "it will kill your car battery." He is such a positive man! Its a humidifier and aromatherapy diffuser. It does pretty well at diffusing the oils just like the diffuser in your house. My car after about a week smelled like Lavender. It didn't kill my car battery. Hasn't burnt the car down! Its a little bulky and doesn't sit straight up and down, because the water holder should be as level as possible. I haven't notice any performance issues with it not being completely level though. If you have any questions leave them in the comments below, Ill be sure to answer them! Wife win my husband turned the diffuser on today when he got in my car and was driving around with us. Score!! He's coming around! I have been really impressed by going through this awesome blog germguardian ac4825.